Both with 6 - Jeff Gordon and Dale Earnhardt Jr.
Don't forgot to factor in 2013 statistics at Martinsville when selecting your fantasy picks this week. This year's rules package makes the 2014 statistics less significant and the 2013 numbers much more meaningful. 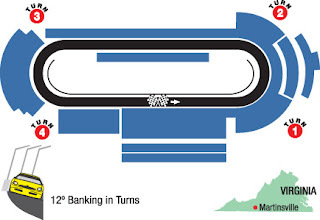 The Likely Suspects: Martinsville Speedway is famous for two things: great racing and those darn hot dogs. Look for some heated moments and these drivers running toward the front this weekend: Jimmie Johnson, Clint Bowyer, Jeff Gordon, Dale Earnhardt Jr. and Jamie McMurray. My 2 Cents: The key to scoring big this weekend is to earn as many qualifying and laps led bonus points -- just in case your driver gets caught up in havoc on the track which is bound to happen. My no-brainer pick this week is Jimmie Johnson. He is followed closely by Joey Logano and Jamie McMurray who have good odds in qualifying well, which means extra points. My next picks are: Clint Bowyer, Greg Biffle and A.J. Allmendinger. I will complete my team with Danica Patrick and David Ragan. My final four: Jimmie Johnson, Jamie McMurray, Clint Bowyer and David Ragan. The Coors Light pole is the most proficient starting spot in the field at Martinsville, producing more wins (21) than any other starting position. Twenty-four drivers have multiple wins at Martinsville Speedway, but only five active drivers have multiple wins: Jimmie Johnson (8), Jeff Gordon (8), Denny Hamlin (4), Tony Stewart (3) and Kurt Busch (2). Three active drivers have a NASCAR Sprint Cup Series average finish in the top 10 at Martinsville: Jimmie Johnson (6.231), Jeff Gordon (6.841) and Denny Hamlin (8.722). Chevrolet leads the series in wins at Martinsville Speedway with 54 victories – including the last eight consecutive races.